This was originally written shortly after The City of Oaks Marathon, Nov. 2011. During a visit back to Raleigh this past weekend I met up with some avid runners and we shared a few running stories. I am reposting this race report for their review and to continue my mental prep to run the Chicago Marathon with my other daughter October 12. There are probably as many reasons to run a marathon as there are people who run marathons. With seven previous marathons to my record I had thought that I ran out of reasons earlier this year. After all how could it get any better than my last marathon in New York City in 2008. The conditions were perfect in NY, I ran my best marathon ever and had fun all along the way. You always hear about the elite athlete who retires while still on top of their game, so why not just call it a career for the marathon? Early this year I had decided to participate in the City of Oaks races in Raleigh NC on November 6th. I had run the Half Marathon races there in 2007 and 2010, earning a second place finish in my five year age group (AG) each time. This year however I would be competing near the end of my age group. Being one of the older runners in my AG it becomes tougher to be competitive against the younger runners. So I decided that if I was not going to be able to be competitive this year then why not run the full marathon course? I would certainly not be competitive in the marathon either but this may be my very last opportunity to run through the beautiful and scenic Umstead State Park which Runners World magazine cited as one of the most beautiful running routes in America. So it was. I would run the marathon as strictly an enjoyable experience. Take in the sights and experiences and be happy to be able to run a very tough, hilly, and challenging course before I start the sixth decade of my life. How many other people are able to take on such a challenge and how many (or few) of them actually do take on this type of a challenge? My serious training to prep for this marathon began back in late June shortly after I paid the entry fee. My weekly running mileage was at least 40 miles/week and my weekly long runs became longer. Then it happened! Somewhere in the middle of the summer I did my due diligence research on the race and discovered that the winning time in last year’s marathon was 3hrs and 29 minutes, which was my finishing time for the NYC Marathon just 3 years ago. The City of Oaks Marathon course was a much tougher course than NYC and it certainly did not have the crowd support of NYC but it was still the same 26.2 miles long. How much tougher could the course be after all? The summer training morphed into fall racing and before I knew it the fall races were over and the time had come to begin my final preps for the marathon. Perhaps the most critical part of any marathon training period is tapering. The final three weeks prior to race day is the toughest part of the marathon training to pass. If not done correctly you will find yourself in a state of tired anguish during the marathon. If done correctly, running a marathon is the last thing you really want to do in the final days before the race. So it was for me, as our bags were packed and my wife and I began the 12 hour drive to Raleigh. I was looking forward to the trip to visit my daughter, her husband, and their dog Barley, but I did not “feel” like a runner at all. I felt fat, bloated, and generally not too interested in running period, let alone a full marathon. As if this was not enough incentive not to run, I was fighting off a nasty cold and I was beginning to have a hacking cough too! The day prior to race day included a drive around most of the first half of the course. This is the part of the course I had ran last year during the half marathon and the challenging hills in and about downtown Raleigh were all still there! This year’s race featured a new start and finish area in front of the iconic clock tower on the campus of NC State University. We were able to drive a short way along part of the second half of the course but most of the last 13+ miles would need to be experienced by me for the first time during the actual marathon. This was just as I preferred too, I wanted to be surprised by the beauty of Umstead. While many marathoners focus on running long distances and logging mega miles per week during their training, I instead focused on running many hills. The long runs were there, but I only had two weeks where I ran over 50 miles. I did this in prep for the Raleigh course and specifically the hills in Umstead. The profile of the race course was published on-line and the most challenging part of the race would begin somewhere after the 13 mile mark with a series of never ending hills highlighted by a several hundred foot climb beginning about mile 18 through to mile 24. My race strategy was to start slow and easy, do not allow myself to become caught up in racing with others but rather to run my own race. I also did not want to be embarrassed and have a bad effort on race day. After all, I had been telling many other runners in our training group how to run a marathon and just what to do. They were all on my mind come race day too. I was thinking it would be nice to run a 3:30 marathon, (8 min/mile average pace) but that it was not going to happen on this course. “Just run your best Lee and let the time take care of itself”. The City of Oaks Marathon field included about 600 runners and several thousand half marathoners with hundreds of others there to run a 10k race too. It would also be a crowded field at the start. Because the race rules would be using the “gun time” (versus chip time) as the official scoring I made it a point to line up near the start of the crowd. The conditions could not be better including the time! It was the first morning of the time change from daylight time and the 7AM start really felt much closer to an 8AM start, including temps that were rising from the low 40’s. So there I stood dressed in my skimpy and very light weight Brooks racing outfit, throw away painter’s hat and a huge garbage bag over my body to keep me warm up until gun time. With 30 seconds to spare, I shredded my bag and was ready to race. The first mile was generally downhill. Not a good thing when you need to start slow and run 26.2 miles. I did start what I felt was a slow pace. Many runners were quick to pass me and I fought off the urge to run fast, “just take it easy Lee”. As we crossed the mile mark my watch read 7:30! Way too fast for the first mile! Not to worry as the next mile was all uphill. So I continued to relax and not get too worried about the hill. Before I knew it the second mile split came up, another 7:30 mile! Dang, I was now worried that I might be wasting an entire summer/fall training season by this quick start. It did not take too long for my continued internal mindset to take over and before I knew it I was running very comfortably along at just under an 8 min/mile pace. Perhaps too fast but then I also felt very comfortable and relaxed, so I just continued to tell myself to enjoy the scene and run my race according to my feel. The aide stations came and went. I took my Accelerade gels at the appropriate times as planned. Generally early in the race so the chemicals would be in my system later when needed in the race. The first came at 4 miles, then at the 8, 14 and 17 mile marks. Much of the first half of the course was in and around downtown Raleigh and most of the course was very familiar to me from having run the half marathon event in prior years. It was not until the course began to meander out of the city that I felt the real marathon race was beginning. This was at the 10 mile mark. I remember hitting the 10 mile mark at nearly exactly 78 minutes and thinking that 78 mins was a decent finishing time for the Crim 10 Mile race and here I had more than 16 miles yet to go! But I continued to feel good. It remained a cool day but the sun was out and shining brightly. My kind of day for a run. A few more quick turns in the course and the marathoners were separated from the half marathoners. What was somewhat of a bunched pack of runners quickly became a long line of isolated runners with long stretches between each runner. Almost as instantly the crowd support became non-existent too. The road that was previously totally closed to all traffic became open to guarded traffic and a lane for runners. It was just the runner, the road, the elements, and the mind of the runner. It was all good. Following another turn we came across a farm field where huge Guernsey cows were grazing nearby. How ironic, here at about the exact same time some of my good running buds were on Staten Island about to start their journey in the New York City Marathon and here I was already deep into my marathon running along side a field of beautiful cows! I was a bit surprised by the extent of traffic that flowed along the road as we turned to begin the several mile journey along side the edge of Umstead. It was getting close to the 12 mile mark and I still was holding my pace and feeling good. The runners were scarce. I had passed several runners in the previous miles since splitting to solely the marathon field. I then sensed and heard a runner coming up from behind me. Was it one of the runners that I had passed? I hate to have a runner pass me after I pass them! It was not someone I passed but rather another runner. A guy who was easily several age groups younger than me. It’s OK to let a much younger runner pass me. We exchanged greetings but I was not there to battle him. Before I knew it I was at the official 13.1 mile or halfway mark. My official split was 1:43:48. Still way too fast but it was a downhill for the last mile too. The course continued to flow downhill although it was difficult to see any actual drop in topography. The downhill slope helped to speed my way along the roadside to the 14 mile mark but before I could actually complete the 14th mile I would have to run up a hill that was definitely discernible! The roller coaster portion of the course was here! While I had yet to enter the forested trail through Umstead, I was apparently close enough to the park to enjoy the ever changing terrain that Umstead is also famous for! It became very tough to run my pace during next two miles. So I didn’t. While I did not give up, I simply did not try too much harder either. I kept telling myself to continue to run MY race. I was also surprised to see that the small group of runners who had been several hundred yards ahead of me or so were now much closer! Apparently they did not do as much hill training as I did this summer and they had to have been feeling much worse than me, actually I was still feeling fine at this time! Well, at least as fine as one can feel for running a hilly marathon course. Suddenly, the reason I was motivated to run this race came, I was approaching the 17 mile mark and ready to enter Umstead Park. However before we could do that there was a slight quirk in the course. Race officials were there directing us to make a right turn instead of a left turn? There was one confused young man ahead of me who did as directed. He was the last of a group of runners I had been chasing up the last long hill. The right turn was actually a brief hairpin turn that was likely required to make the course the official distance. I used the hairpin portion of this turn to pass this fellow who was easily 20 if not 30 years younger than me to pass him! A few more strides, a shot of my Accelerade GU, a drink of water, and I was onto the path in Umstead! Urged on by the group of volunteers at the last aide station as I entered Umstead, I found myself running all alone. There were a few runners behind me, but the next closest runner was several hundred yards ahead of me. My run through Umstead was going to feel like a nice solo run through a park. The path changed from asphalt pavement to a hard packed dirt with gravel path about the width of a single lane road. The sun shone through the dense forest of tall oaks with their golden leaves waiving gently at me. The road began to climb a bit as it also began to meander. This was everything that had been promised it would be, except that I was still running a marathon. A few runners began to pass me! But not to threat for as they were running much faster than I cared to run, they also were wearing a sign on their back that read “Relay”. Meaning they had just begun to run their part of their relay leg. Since these folks were not my competition and since they were obviously had much fresher legs. I let them on their way. It was actually a small blessing for now I had someone to follow through this course. It was not all uphill in Umstead, there was a point at which shortly after passing two runners we came upon a downhill. The downhills were never as long as the uphills of course. 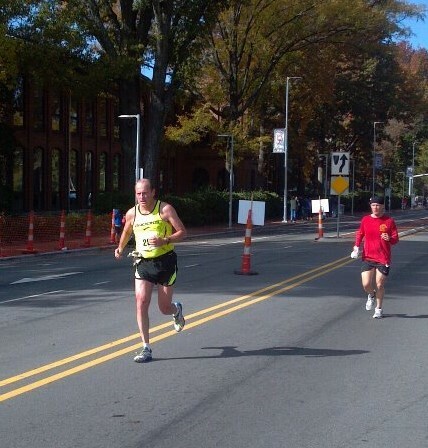 Nonetheless I used this strategically placed downhill to race hard, kicking out a 7:49 18th mile! Was I nuts? Apparently so, for I slowed a bit the next few miles. It was a little bittersweet to see the next aide station after the 20 mile mark for I was now leaving Umstead and returning to the sun drenched asphalt bike path and roads. I was still feeling good and remember mistakenly thinking that I had survived the worse of the hills. I might have survived the worse but I was not done with the hills yet. I had at least two more miles of “rolling” hills to conquer before I could begin to think about the finish. It was at this point that I began to break down the balance of the course into 2 mile splits. I also continued to pass the few runners that were ahead of me. Some were walking now and that certainly did look inviting, but it was not in my vocabulary that day. I remember making one of the last turns back onto the main road and feeling totally lost! Which direction? left? right? Fortunately there was a traffic cop there to direct me in the right direction but I feel I lost several hundred feet at least of distance. Surely the next turn would put me back onto the main road to the finish! Uhm, no… well maybe the next turn? No, my mind was playing tricks and I could not think right any longer. Why waste the effort, I was finally able to spot the last turn and I knew just a few more miles to the generally flat to downhill finish. It was at this point that another runner came up to me and began to pass me. This fellow looked at least my age and was not wearing a “Relay” bib either! I really did not feel like racing him at this point and my fatigued brain let him run ahead of me for a few hundred yards, at least until the next aide station. It was here that he STOPPED to take a drink and while I wished I could stop I saw this as an opportunity to pass him and take the lead versus him for the last few miles. There were a few folks standing along the side of the road cheering me on again. Now they were able to see my name on the race bib and gave me a personal “Go Lee” cheer. Of course it probably helped that I was running slow enough for them to actually read it too. Before too long the isolated cheers gave way to the lined streets of the finish line. I still had at least a mile and a half yet to go, 6 laps I told myself. There was one last stinking hill! It came and went and I ran as best as I could towards the sound of the PA speaker at the finish line. I could see the finish banner ahead now too. I had a few miles in the mid to upper 8 min/per mile pace while in Umstead and I knew I was not going to hit the magical 3:30 mark but I also knew I was running well and in just a few moments the marathon would be history! Official chip time, 3:35:09, official clock time 3:35:12.! I wanted to stop but had to keep my legs moving, keep the blood flowing. I walked around the crowded finish looking for my daughter Bridgett and her husband Shane. They had each ran the half marathon. I am proud to report that they each achieved a personal record (PR) for their effort in the HM too! For Bridgett it was her first HM and she battled through a number of injuries during her summer training to finish more than 15 minutes better than she anticipated! We posed for a small group picture at the finish and headed back to their house. It was not until later that evening that I discovered that I had actually won my Age Group! I had WON A MARATHON! What makes this win especially important to me is that I did this with only a few weeks left as a competitor in the 55-59 age group too, for next year I move up to the next 5 yr group. So the question is, is this the time to retire from running marathons? At this time I truly have no desire to return to defend my position next year and I lack the fire within to run another marathon. I will however have a very good and lasting memory of The City of Oaks Marathon. Thank you to the organizers, volunteers, sponsors, and people of Raleigh for this event, you are all to be congratulated.